From the very beginning, I had some definite ideas about how I wanted to approach a teen strip. 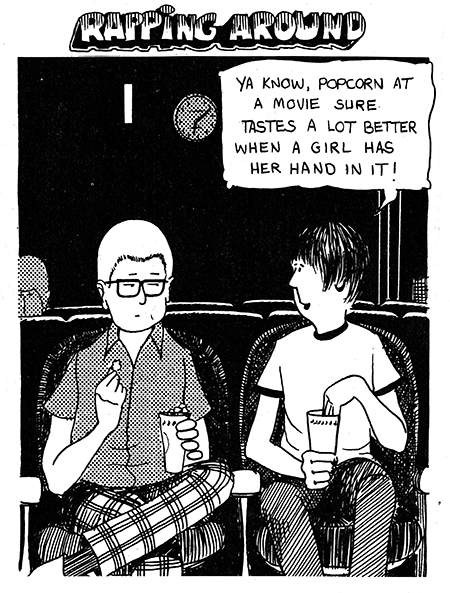 The crop of teen strips in the early seventies seemed oblivious to the time in which they existed. The enormous changes taking place in the youth culture were quickly making the strips with the jalopies and letter sweaters irrelevant. They’d all been around awhile and were being done by middle-aged men who were viewing things from a rose-colored distance. My new cartoon was going to be an inside job. I was just out of school myself and, even more important, was teaching in one. I decided to avoid the standard teen strip clichés. There would be no teenagers hanging on the phone or parents yelling at them to clean up their rooms; there would be no letter-sweatered football hero trying to decide which cheerleader he wanted to date. Instead, I was going to write about the realities of the school that I knew, from the tedium of being an unheralded and unrecognizable member of the band to the horrors of having to climb the dreaded rope in gym class. Rather than focus on jocks and cheerleaders, I was going to write about everyone else. Avoiding the parent-teen clichés also meant that with one small exception there wouldn’t be any parents in the strip. The only adults would be the teachers—but, again, since I was one, it would be an inside job.